FSX – X06-Arcadia Municipal Airport. Located in Arcadia, Florida for FSX/FSX-SE Arcadia Municipal Airport (X06) located in Central Florida (FL), USA is a publicly owned public use facility established in July, 1940. X06 features a 3700 x 75 ft lighted asphalt runway with 2-light PAPI – runway 6 end and a 2780 x 140 turf cross runway. The airport has a lighted wind indicator and a sunset to sunrise white-green beacon. The main parrallel taxiway and all feeders are designated ‘A’. 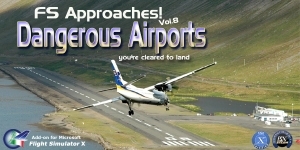 The airport lists 12 home based aircraft – 7 single engine, 1 multi engine, 1 helicopter and 3 ultralight. This entry was posted on October 23, 2018 at 11:05, and is filed under Scenery. Follow any responses to this post through RSS 2.0.You can leave a response or trackback from your own site.